Today’s Media Launch of the RAF Cosford Air Show 2019 revealed further details of this spectacular annual event. The Air Show organisers were excited to announce the iconic Chinook helicopter will be performing in the skies over Shropshire on Sunday 9th June, and the RAF Chinook Display Team was present at the Media Launch. The Royal Air Force has one of the largest fleet of CH-47 Chinook helicopters in the world, primarily used for troop movements, resupply, and battlefield casualty evacuation. 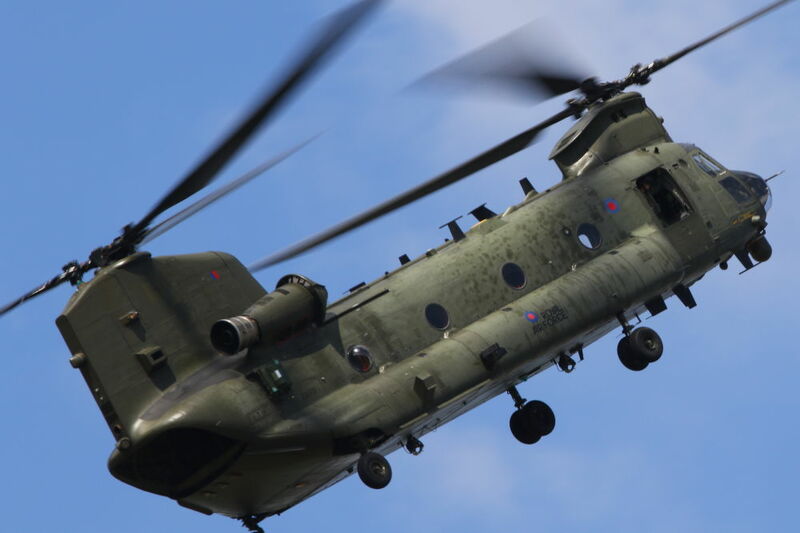 However, despite its size, the Chinook is an extremely agile aircraft and the flying display will showcase its incredible manoeuvrability to Air Show visitors. Also on hand at the Media Launch, Flt Lt Jim Peterson from 29 Squadron talked about the Eurofighter Typhoon’s display sequence, which he will be performing at the Air Show demonstrating the aircraft’s speed, agility and power. The display pilots for the Tutor and Tucano were also present today. Both aircraft will be performing in the flying display in June. The RAF Cosford Air Show will also be one of the few UK opportunities this year to see the world-famous Red Arrows performing their thrilling show before they depart for a tour of North America. As well as dazzling displays in the air, there will also be an array of aircraft on static display across the airfield on Sunday 9th June, allowing visitors to get up close and even climb into some of the cockpits. A full list of British and overseas aircraft coming on 9th June is available on the show website, www.cosfordairshow.co.uk, more aircraft will be announced over the coming weeks. The sell-out centenary RAF Cosford Air Show 2018 raised £189,000 which will be donated to the RAF100 appeal and local charities, to further support and encourage those who are involved with the Royal Air Force and the local community. With the Air Show fast approaching, and with no tickets available at the gate, those wishing to attend are being encouraged to purchase their tickets soon. Air Show Tickets, priced £29.00, are currently available from the Air Show website and RAF Museums at Cosford and Hendon, as well as selected Tourist Information Centres. Accompanied under-16s enter the Air Show for free, making the event a great family day out.